Since childhood, the question “How will our church grow?” has been asked in every congregation I have attended. Over the years, brainstorming sessions about evangelical outreach frequently turned to whatever media was available at the time — an ad in the local newspaper, a well-designed promo in the telephone book, a smart television or radio commercial. While the methods of media have dramatically changed over this same time, one statistic has stayed the same. Eighty percent of the people who come to a church for the first time do so because of a personal invitation from someone who already attends. This isn’t to say that churches should not have used media as an outreach technique. But advertising can never replace a personal testimony about a church. While many of us want to share our faith and invite others to our church, we struggle to find the right words. Interestingly, the latest iteration in the world of communications — social media — offers a new and different possibility in telling others about what matters to us. Church leaders are rapidly taking notice. Throughout the morning, congregants of all ages tweeted prayers using their personal mobile devices, and these prayers were shared on the worship screens to strengthen the church’s sense of community. The presence of congregations on Facebook, Twitter, and YouTube is skyrocketing as churches realize the value of connecting with news and information via these platforms where many of their constituents spend time throughout the day. With 995 million users on Facebook alone, each with an average of 229 Facebook friends, it is no wonder why churches are utilizing this resource. The ELCA church I attend when working in Manhattan, New York, has used this year as a time to imagine and experiment with the congregation’s Facebook presence. Led by staff and volunteers, social media posts have included promoting church events, sharing congregational photos, and providing spiritual quotations and prayers on a daily basis. One of many surprises was the response to a religious cartoon that portrayed God’s enduring presence and comfort in a humorous but helpful way. The cartoon was shared by 70 of the church’s Facebook fans, and at the end of the week, 7,000 new viewers had come to the congregation’s Facebook page as a result. My neighborhood ELCA congregation in Eden Prairie, Immanuel Lutheran Church, used Rally Sunday in September as a time to experiment with a live Twitter feed during the service with the hashtag #ilcprays. (See the image, below.) 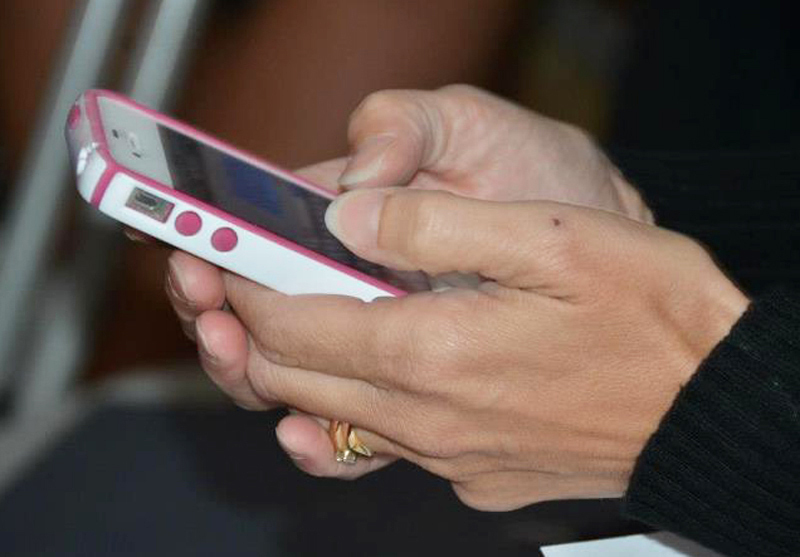 Throughout the morning, congregants of all ages tweeted prayers using their personal mobile devices, and these prayers were shared on the worship screens to strengthen the church’s sense of community. Much like the Good News of the gospel, the power of social media is how news and information multiplies. Initial research is showing that more than just the exchanging of information, social media is becoming a powerful influence in motivating users to change their behaviors and even daily plans. A recent study by UC San Diego, http://www.nature.com/news/facebook-experiment-boosts-us-voter-turnout-1.11401, revealed that Facebook users who saw a message on their account that close friends had voted in the 2010 general election were more likely to turn out to the polling place themselves — to the tune of 340,000. The 10 closest friends on Facebook, the ones an individual was the most likely to have a face-to-face interaction with, drove the whole effect. 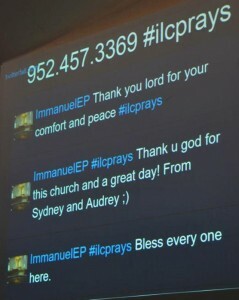 Congregations like Immanuel in Eden Prairie, with an active presence on social media, report similar results. When their church members share the congregation’s events and activities with their Facebook friends, the congregation sees an increase in visitors but also increased participation by members and friends of the church. Like any other media, social media does not come without its challenges and even dangers, especially when used within a community of faith. The New Media Project, www.newmediaprojectatunion.org, is a national research program surveying the rapidly changing landscape of communications for people of faith and compiling very useful data on its website. 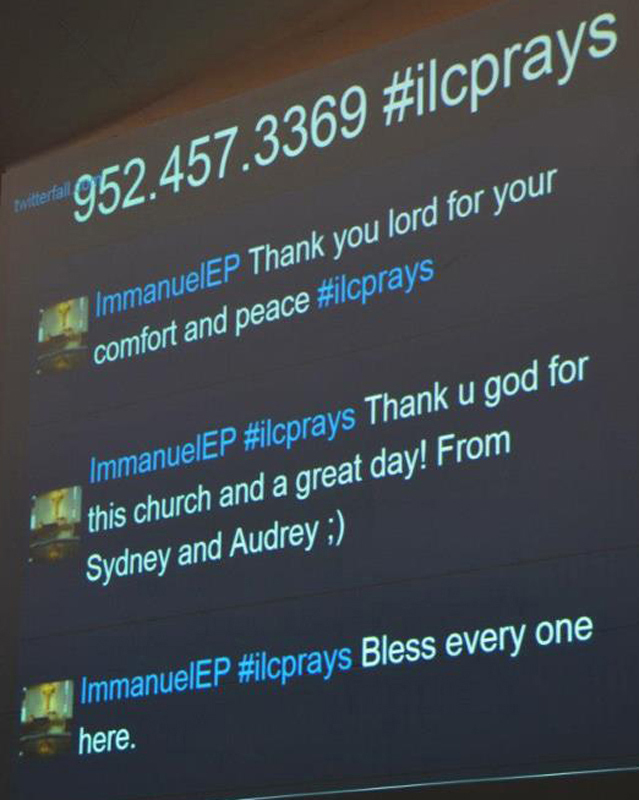 With the hashtag #ilcprays, worship participants are able to read on a large screen in the sanctuary the prayers of other members. Social media has become a community of interconnectedness where our world resides. God is there. And the church needs to be there too. Mary Brown works in media with the Odyssey Network in New York. She is an ordained ELCA pastor and lives in Eden Prairie, Minnesota.